I've only taken two types of cuttings in the past, but it turns out there are five options. Leaf cuttings are more often used with non-woody plants, although if you want to root rhododendrons, magnolia, red maple, or clematis, you may want to check out this technique. 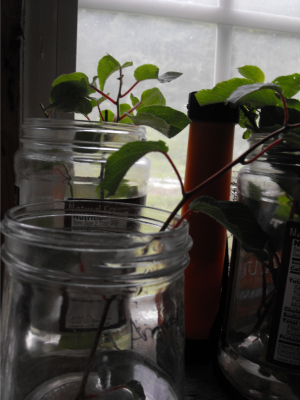 The other seldom-used technique is root cuttings, which take a lot of time and attention, so are often tried after all else fails. The last three types are all stem cuttings, which are distinguished by the time of year at which you take the cutting. The one I've found easiest is hardwood cuttings, which involve taking six to twenty inches of last year's growth in the fall or winter (just like you'd cut scionwood for grafting). It's important to discard the tips of the cuttings and to keep hardwood cuttings cool so they don't start growing before roots form. 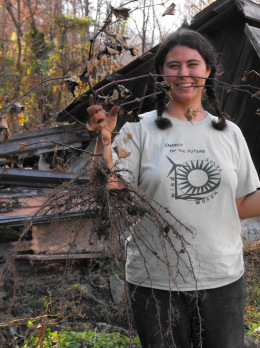 (If the cuttings leaf out too soon, they'll use up all the energy stored in the wood and then die.) I'll write in a later post about techniques you can use to increase your success rate, but in general, hardwood cuttings are sometimes treated with rooting hormones, are sometimes callused, and then are generally just stuck in the ground to go about their business. When taking softwood cuttings, cut a two to five inch piece of twig that includes several leaves, treat with rooting hormone (usually), and be sure to keep the cutting moist with a misting apparatus or humidity dome. You'll know when your cutting has rooted because a gentle tug will meet with resistance --- at that point, wean the plant off the mist (or the humidity dome), but keep it in your nursery area for quite a bit longer. Some softwood cuttings can be planted out the first fall, but most do better if you overwinter them under protection and then plant in the spring, or even let them stay in rooting bed for two years. This is where I've had trouble with softwood cuttings in the past --- I want to rush them out to the real world, where they inevitably peter out and die. The final type of cutting is a semi-hardwood cutting, sometimes known as a greenwood cutting. This is a niche technique, a bit like stem and root cuttings, with most species responding better to either softwood or hardwood cuttings. However, evergreens (both broadleaf and needle) seem to enjoy greenwood cuttings. To take a greenwood cutting, cut your twigs after the wood has firmed up, the leaves have matured, and growth has ceased, usually between mid July and early September. Remove the tip if it's soft, then cut your twig down to three to six inches long and remove leaves from the lower half. Wounding (which I'll cover in a later post) is sometimes used to promote rooting, and hormones are usually used, as well as mist. Greenwood cuttings usually root in one to three months. 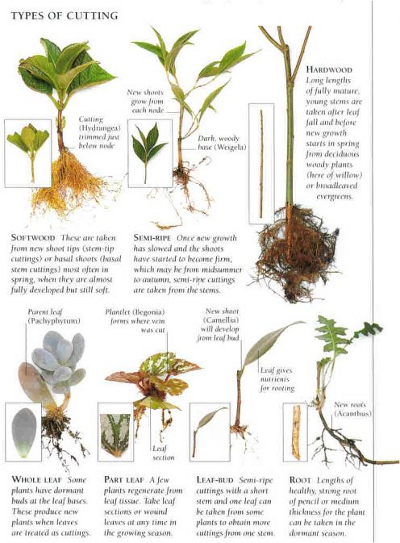 Each kind of plant responds well to one or more method of rooting, so it's useful to do a bit of research before choosing your technique. If you have a choice, though, I recommend trying out hardwood (and now's a good time to do so). I'm experimenting with rooting grapes, mulberries, figs, and gooseberries this winter and know that at least the first will do well since I've had success with them before. More interested in animals? My 99 cent ebook walks you through developing a perfect pasture for your chickens.